Arm your soldiers. Learn new combat techniques. Equip gear for a wider variety of climates. Take the fight to the Empire! 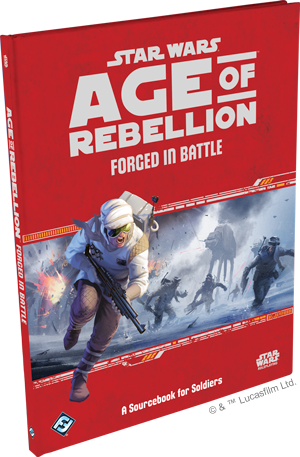 Fantasy Flight Games is proud to announce the upcoming release of Forged in Battle, a Soldier sourcebook for the Star Wars®: Age of Rebellion™ Roleplaying Game. The Alliance to Restore the Republic rests on high-minded ideals, but its battles must still be won in the trenches. The Rebellion’s troops go into every battle outnumbered and outgunned. Its soldiers know that they're fighting a war against long odds, but they remain undaunted. Instead, they rally together, using their cunning, skill, and courage to ensure that the hope for freedom persists in the galaxy. 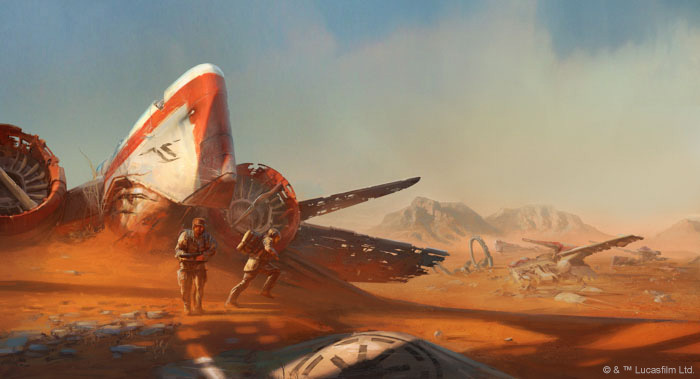 The Galactic Civil War is marked by countles soldiers stationed on countless planets. 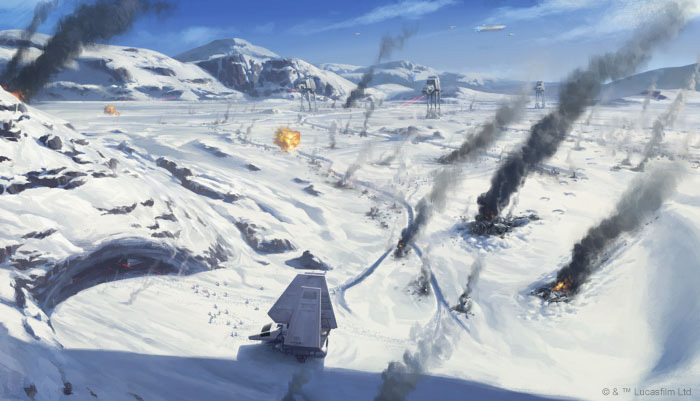 A fearsome weapon such as the Death Star might blast a planet into shattered rock and space dust, but if the Emperor wants to utilize a world’s resources or population, he needs legions of stormtroopers and Imperial Army forces to take and keep control of a world. Likewise, the Rebellion must field its own armies to take new territory and protect its much smaller—but all the more vital—military installations, as well as locations sympathetic to the cause. 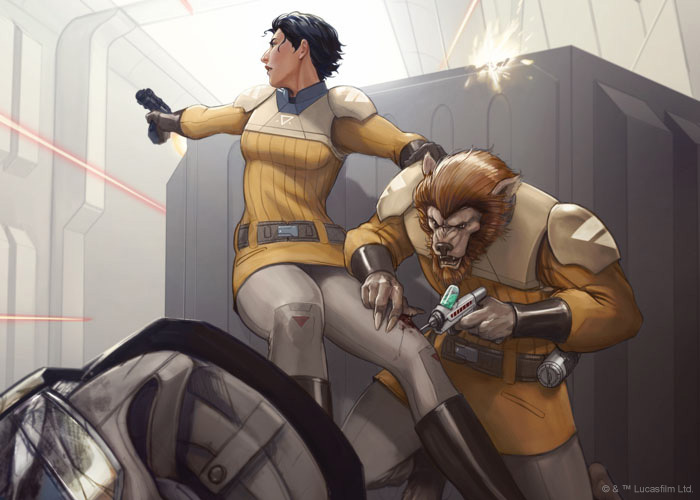 Though outnumbered and often outgunned in every major military category, rebel soldiers know their successes advance their cause and inspire new allies to join the Rebel Alliance. The odds may be against them, but bravely battling the odds is just one of many struggles for the Rebellion to overcome. Forged in Battle reinforces these heroes with three new species and rewards their bravery by granting them access to three new specializations and two signature abilities that better allow them to express their unique talents in the heat of combat. The Heavy uses sweeping arcs of withering firepower to destroy foes at range. The Trailblazer swiftly traverses rugged terrain, serving as a scout, a guide leading allies, and a wilderness infiltrator. The Vanguard is extraordinarily tough, skilled at breaching enemy fortifications, and excels at leading the charge into combat. Meanwhile, the book's signature abilities allow Soldiers to dominate the battlefield in ways that no other characters can, and new Duties and Motivations present you with new ways to tailor your character for the rugged path that lies ahead of him or her. The war between the Empire and the Rebellion may be fought by soldiers, but weapons are often the deciding factor in which side triumphs. Soldiers depend on blasters, missile launchers, incendiary devices, and more to gain the upper hand in a fight, and in a war-torn galaxy, there is no shortage of weapons from which a warrior can choose. While armaments are ubiquitous across the galaxy, and are used by moisture farmers defending their homesteads and security officers suppressing rioting mobs alike, professional soldiers are generally the only people to wield true weapons of war. Accordingly, Forged in Battle outfits your Soldiers with a wealth of new military grade weapons, armor, gear, and vehicles. From the book's energy weapons and slugthrowers to its amor and vehicles, these are designed to support a wide variety of roles and climates, so that you can better equip yourself for whatever mission lies ahead, no matter the battlefield. Of course, weapons are merely tools, and they may sometimes fall into the hands of evil. This means that with its extensive collection of new weapons, armor, and combat vehicles, Forged in Battle makes for an excellent book for Game Masters looking to challenge their players with a variety of new encounters. In addition to the new character options and gear offered within, Forged in Battle provides Game Masters with advice for running adventures that feature Soldiers in military missions and campaigns. More than that, it goes beyond looking at the use of Soldiers in combat-heavy campaigns to explore how they might play a part in stories where the battlefield is not necessarily the focus of the adventure. To get you started, Forged in Battle explores a number of specific encounters and campaign ideas, and features details for using specific tactics, combat types, and challenges posed by the combat environment in which those with military training excel. Finally, the book discusses suitable rewards for campaigns focused on Soldiers, as well as rewards that are appropriate when your Soldiers participate in adventures or campaigns focused on other missions or storylines. Reward your Soldiers with an array of weapons and character options bold enough to match their bravery. Help them take the fight to the Empire. Forged in Battle is scheduled to arrive at retailers in the third quarter of 2016!